Take the time to send Christmas greetings and wishes to friends old and new; to family close and far. Use these Merry Christmas greetings for your card or messages. It is a time when we express our love and appreciation for each other. We hope you enjoy our collection of greetings and wishes, and that you find ones that you want to share with the people in your life. You may also find words in our collections of Christmas poems, Christmas quotes, or Christmas messages that you wish to share with others. I'll be there to ease the drought. That blessings will always work out. That you will find you have a tableful. May this card find you in good health, and may your Christmas bring good memories with lots of love. Over the year life gets so busy, but at Christmas, those who are dear to us come to mind. I am writing you to say even though we get busy, you are always in my thoughts. Wishing you the Merriest of Christmas's! The weather is getting chilly, the children are counting down the days, the trimmings decorate our house and thoughts of special people come to mind. You are one of those special people and I wish you a Joyous Noel! Upon this day my wish for you is bountiful splendor in all you do. The season of gladness and joy rings out my wish for you is happiness throughout. Salutations and great joy to you this Christmas Day. We hope you have lots of time to play. Our very best to you and yours, with warmth and gladness that endures throughout the year. For joy and peace be yours so true. So you may dash sadness to defeat. May blessings always come your way. During this Christmas season of faith and family, may the real meaning of Christmas shine so bright. There is nothing more I wish for you, that God may bless all that you do. I wish you fond memories of family and friends that will give all of your wishes. It's not hard at all to wish you a very Merry Christmas. You are the one who adorns my space with warmth, cheer and kindness year round. For you, I wish your Christmas Day be full of happiness, friendship and joy. I was looking for an inspirational quote to send in this card, and I realized the best thing to say is just to say: "Merry Christmas, I love you! The thought of not being with you at Christmas makes me feel sad. But we will be together again and for that, I am very glad. Remind you that there are those who always care. 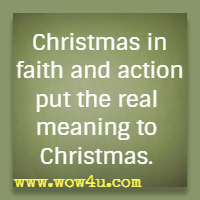 Christmas in faith and action put the real meaning to Christmas. Be true to the real meaning of Christmas and share love, cheer, and hope to those less fortunate by sharing your good fortune. May the peace that Jesus brings fill your heart and home this Christmas. We can see it in all you do. Our prayers include a special Christmas blessing for you. May God watch over you and your family in the coming year. Wishes and good cheer from all of my family to you and yours this Christmas. The gift of love. The gift of hope. The gift of joy. The gift of peace. These gifts cannot be purchased in a store, nor can you buy them with money. 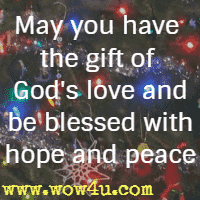 The gifts of peace, joy and lasting happiness are the gifts I pray for you this season. Sending you Christmas blessings for the season and the coming year. May the feeling of togetherness, the closeness of friends, the love of your family and God's blessing fill your spirit this Christmas season. May God's peace fill you this Christmas, may you have a blessing of hope, and may your faith be strengthened at this amazing time of the year. The season of Christmas is one where we love to give, one that we celebrate with friends and families, one that everyone seems friendlier and full of love. May the love of the season fill your heart and your home. The years may have separated us in distance but not in thought. While it may not be possible to be together this Christmas Season, it does not mean that I'm not there in spirit. My wish for you is stuffed full of good cheer, good health for the coming year. Here's wishing that every family member (uncles, aunts, nieces, nephews) the very best Christmas that each of you deserves. You all mean so very much to us and so we send our love and good cheer for this Christmas season. When I count my blessings, I count you twice. Distance and time may be a void but that makes our expected time together even more valuable. Best of the Season until we meet again. This time of year, I am reminded again and again how much you have contributed to our family. You've given us hope when hope seemed lost. You gave us nourishment for our soul when none was there. 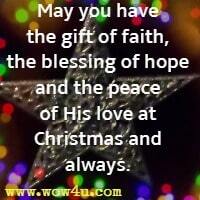 Our special wish for you this Christmas is that blessings will follow you. we pray that time will find you well. We hope that we will someday meet. The birth of Jesus cast a glow. Blessings of the Christmas Season be upon you. 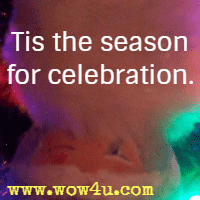 Tis the season for celebration. May yours' be filled with happiness, good friends and bountiful cheer. Wishing everyone a fantastic holiday. Well wishes and warmth of the season be yours this Christmas. May you find joy in Christmas may it fill your heart and home. every day in the New Year is as special as this one. You'll always give a special glow. So always know that I'll be your host. I no longer have to sigh. A welcome part of your glee. That your encouragement is so divine. Warm wishes for every blessing. My heart feels so warm, especially at mealtime. for making those scrumptious dishes this season. So we can all celebrate with good cheer. May it be my wish so tall. To count your blessings and forget the tree. May God use us to His delight. May God's eternal hope be your light. For those who believe The Way. That all who yield do so in peace. Warm greetings and love to you this Christmas Day. Christmas is that time of year when family and friends rejoice. Let us not forget to count each and every blessing that we may have taken for granted. It is with these thoughts of remembering how much you do for us that we want to thank you for always being there throughout the entire year. With love and appreciation, Merry Christmas. May your home be filled with laughter and joy, with friends and family and all the toys. May you find this Christmas bright with cheer and richly abundant with the many pleasures of good fellowship. May the spirit of the first Christmas enter all of our hearts now and throughout the coming year. To those who strive but live without cheer. So we may share because we believe. You give so much, you are swell. But you are always like our rock star. Because you have a common touch. Great joy and cheer this year throughout. This time of year reminds us to acknowledge all the good things in our lives. So, it is to you we tip our hat giving you thanks for all you are and do. Have a great and joy-filled Holiday Season. It probably decided to hide from thee. You could lose your hair. I know that your complaint is a slip of the tongue. That all your blessings will show their true. May the lights of Christmas shine bright and may the brightness remain with you all year long. As we go about our daily dashes. That life must always have some fizz. I'll be soon stopping in your doorway. It's hard to find the right words to express how we feel about you especially at this joyous time of year. Your kindness, warmth and unselfish attitude has and always will be such an encouragement to our family. May the joy and peace of this Christmas be with you and your family. Grateful you are a special part of our life not just at Xmas but the whole year through! During this special Christmas season, may you have eyes of joy, and the excitement that a child does, be full of joy and good tidings to all those you meet. Enjoy and take pleasure in the Holiday season. Our prayer this Christmas season for you and your family is that you see God's promises being fulfilled and that you feel His many blessings in your life. This Christmas greeting comes to you with love for all you do each and every day through May you be blessed during this season and the whole year too. May you have the gift of God's love and be blessed with hope and peace this Christmas season and may it stay with you in the New Year. This greeting card is filled with wishes of peace, happiness and joy during this season of celebration. May Santa's naughty and nice list see you on the nice side, as we do! May the sparkle of the lights remind you how special you are to us. Is together we will spend Christmas this year. Here's a world of happy wishes for each day through all the year. for which all Christians should rejoice, and I do sing in rhyme. Heaven bless my master and my dame, Lord bless me and you all. Here's to the year past and friends who have left us. Here's to the present and the friends who are here.